We all know by now the amazing benefits of breast milk. But now Scientists Discover Breast Milk Kills Cancer Cells too! The benefits of this “liquid gold” not only provides babies with the perfect nutrition. It goes beyond that. 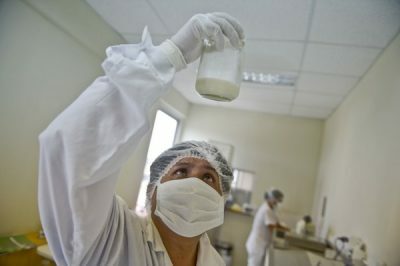 Now Swedish scientists Discover Breast Milk Kills Cancer Cells. They discovered it “accidentally” when they saw that breast milk killed tumor cells during an experiment. The benefits of breast milk are simply AMAZING! It was Professor Catharina Svanborg, an immunologist at Lund University in Sweden, who made the discovery when working on antibiotics. To everyone’s amazement, trials in patients with bladder cancer have already yielded promising results and researchers believe the compound breast milk contains – nicknamed Hamlet – will also help tackle bowel cancer and cervical cancer. “There’s something magical about Hamlet’s ability to target tumor cells and kill them,” Svanborg explains. She explains that it seems these cells can hone in on cancer cells while leaving healthy cells unharmed – meaning, of course, it has none of the debilitating side effects of chemotherapy. Professor Svanborg explains that human breast milk contains a protein called alpha-lactalbumin, which is transformed into a cancer-fighting agent when in the gut. The substance attacks cancer cells in numerous ways – first evading the cell’s outer defences, then targeting the “power station” mitochondria and the “instruction manual” nucleus. These actions essentially cut off the cell’s energy source and “program” it to commit suicide, in a process called apoptosis. According to the press release, early trials in patients with bladder cancer show those injected with Hamlet start shedding dead tumour cells in their urine within days. A full-scale trial pitting Hamlet against a placebo “dummy drug” is now planned. I hope you enjoyed this Scientists Discover Breast Milk Kills Cancer Cells post. If you are interested in reading more about my blog, please take a look at my latest articles. I am a mom blogger who loves to share creative and healthy fun food ideas, family activities, natural remedies, parenting advice, and tips for living a healthy family lifestyle.